IROCC was born 1992 in Munich. Without a doubt his parents gave him a lot of musical talent since his Dad had some Arabic Rhythm and his Mum served some classical melodies branded by the choir where his parents got to know each other. They recognized very early that Leon is chosen by the god of music so they sent him to dancing classes of dancing crew Aloun Petnoi and Step2diz. The probably most important step for his career as a DJ and Producer was joining the breakdance crew of “Crossed Colors” in the year 2007 in the age of 15 years. At that time he got to know the BBoy and future founder of “Hansi’s Room”, K-HANS-K (alias Hans Kohler) of the Los Caballeros Crew. Together with Crossed Colors Crew Member C-Ras (aka Christoper Smith) IROCC learned the basics of DJing in K-HANS-K’s flat which was more than just a living area. As time passes IROCC and C-Ras started to compete in several HipHop-Events and Competitions. In 2012 the duo decided to produce music their selves. That was the birth of the GREENERYFORCE represented by Instrumentalists and MC’s. Mostly influenced by Funk, Jazz, Reggae but also by Dub, Bossanova and Samba the crew will always return to their roots – HipHop instrumentals and beats. 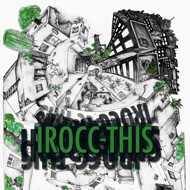 IROCC’s first official album THIS is brought to you by the music label out of Munich City KELLERFLAVOUR. You will find a variety of sounds on the album since it was definitely influenced by Leon’s 6 month journey to Brazil, where music is without a doubt more than just music. Enjoy!